This recipe for oxtail stew in red wine is adapted from "The New Book of Soups" by The Culinary Institute of America (Lebhar-Friedman Books). 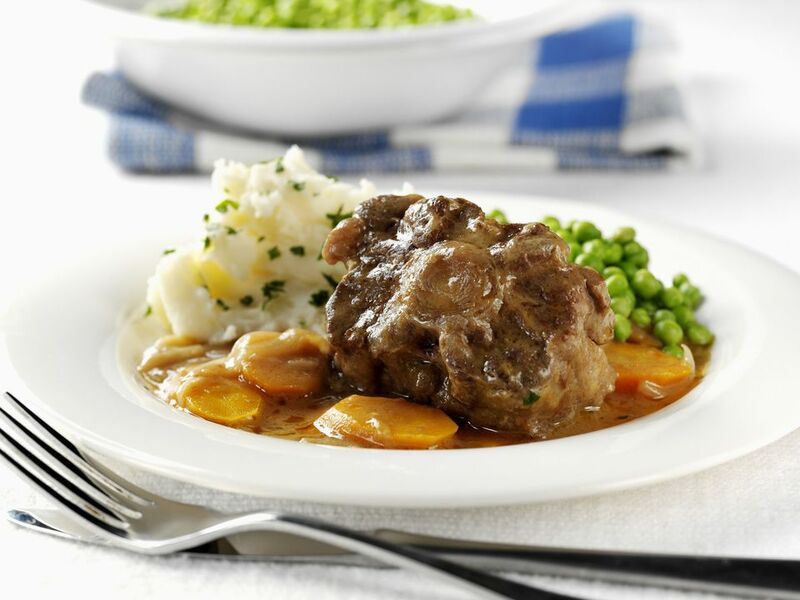 Eastern Europeans love oxtails and this delicious stew served with thickened pan juices and roasted potatoes or mashed potatoes fills the bill. In Polish, this is known as gulasz ogonowa, and in Hungarian, it is tejfölös ököruszály. Compare this to an oxtail-barley soup. Oxtails actually come from the tail of beef cattle. At one time, oxtails actually did come from oxen, and eating them is just a part of nose-to-tail eating so common among Eastern European cooks. Today, oxtails are considered gourmet fare. The same is true of pork belly, once relegated to the sausage grinder. Generously season oxtails with salt and pepper. In a large Dutch oven or casserole, heat oil on high heat until it shimmers. Add oxtails in a single layer to hot oil, working in batches if necessary, and sear the oxtails until browned on all sides, about 10 minutes. Remove oxtails with tongs to a plate (leaving the oil behind). Cover oxtails loosely and set aside. Return Dutch oven to high heat until oil shimmers. Add onion, leeks, and garlic and saute, stirring occasionally, until golden brown, about 15 minutes. Add tomatoes and cook until it deepens in color and smells sweet about 2 minutes. Add sherry vinegar and honey. Stir until honey is dissolved. Return oxtails and any juices to the Dutch oven, stirring gently with a wooden spoon. Add red wine and enough broth to cover. Bring to a boil, reduce heat and add a bouquet garni made by tying the parsley, thyme and bay leaf together in cheesecloth with butcher's twine. Cover and let simmer over very low heat until meat is nearly falling off the bone, about 2 to 3 hours. Transfer oxtails to a heated serving bowl and keep warm. Remove and discard the bouquet garni. Return Dutch oven to heat. Skim off fat and oil from the surface of pan juices and bring to a simmer over medium-high heat, until juices have thickened slightly about 5 minutes. Season to taste with sherry vinegar, salt, and pepper. Pour sauce over oxtail pieces and serve immediately with roasted potatoes.